Yachats "The Gem of the Oregon Coast"
Yachats (pronounced YAH-hots) is derived from the Chinook Indian word, Yahuts, meaning dark waters at the foot of the mountain. It does indeed sit at the base of the coast range along the Pacific. Located at the southern tip of Lincoln County this small village enjoys a calm, unhurried lifestyle which may be why it is so popular with vacationers and residents alike. 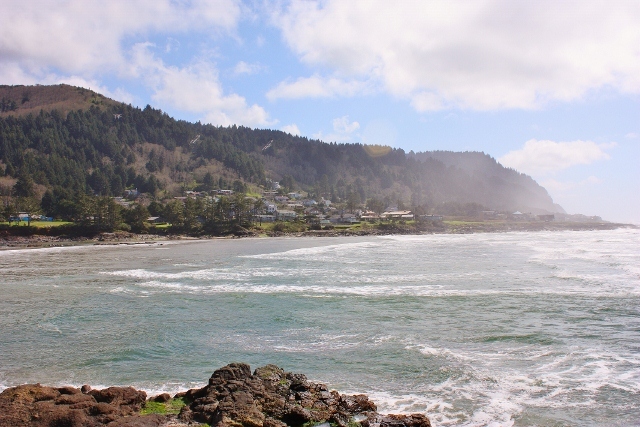 Among the many things to do in Yachats are beach exploration, tide pooling, hiking trails at gorgeous Cape Perpetua Scenic Area, bike riding, whale watching, bird watching, boutique shopping along with great art galleries, fabulous dining, golf, fishing, clamming & crabbing, dune climbing and of course dune buggy rides. Home to many artists, musicians, retirees and lovers of nature. So far, this one is looking sweet!